A children’s playset is not the cheapest plaything or outdoor feature you can purchase for your home. Assembling and mounting one is not the easiest thing you will do as well. With dozens of different parts in various sizes, it can take you hours to set up and finish building a playset. Once you finish assembling it, you will definitely feel a great sense of pride and accomplishment. And because this outdoor feature already holds a special place in your heart (and not only with your kids), leaving it behind is not an option when you have to move. Before you start disassembling the playset, check the whole structure to see if its condition will be worth the effort and cost of moving it. If most of the metal parts are already rusted and the wooden frames have rot spots, you may need to rethink your plan. If the playset is new or well-maintained but has a few weak spots, it will be worthwhile moving it instead of buying a new one. However, be extra careful with disassembling and handling the damaged parts. Depending on the type of playset you have, the weather can impact how easily you can disassemble it. If you are moving during the summer, you will have little to no problem with disassembling the playset, whatever type it may be. 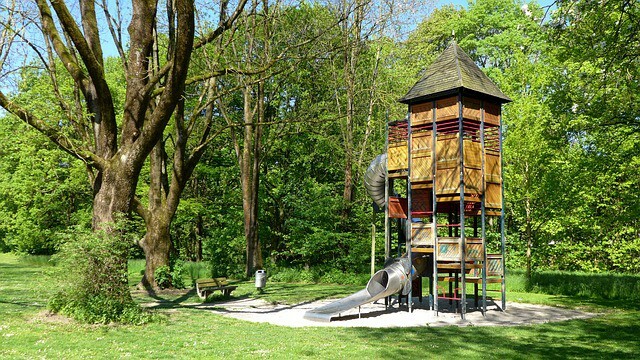 However, if you are moving in the winter, removing the play equipment from the ground may prove to be more challenging. This is because the ground is often frozen or can become hard during the cold months. You will, therefore, run the risk of breaking some boards if you forcefully remove the playset while it is still frozen. So if it is at allpossible, try disassembling the playset when the snow has melted or the ground is no longer frozen. Before you start taking the playset apart, take wide angle shots of the entire thing and close-up photos of the different parts or areas. These photos will come in handy during reassembly. Also, take photos of or note all of the connectors and mark all of the connecting joints using a marker or tags. This will facilitate faster reassembly later. To avoid damaging any component, make sure you use the right tools for disassembling the play equipment. If you damage any parts, screws or bolts, you will need to order their replacement; the photos and notes will help you order the right items. Always have the user’s manual on hand during disassembly as well. Once you are done, store the swing separately in a box or bin to keep the chains from getting tangled. Store the other parts in a large box or container. You can place the other large parts such as the roof and walls as is inside the moving truck. However, make sure they are properly secured. Before you start reassembling the playset, inspect the new yard to be sure the play equipment can be installed here. Make sure there is enough space to accommodate this outdoor feature. Next, consider how different the new area is from your old yard. If your old yard was inclined, the playset legs may be longer on one side. In this situation, you might need to re-level the play equipment legs before you can start with reassembly. You can always get help from playset assembly service providers if you are not sure you can handle the process correctly. Although moving a backyard playset may seem like a challenging feat during a home relocation, it doesn’t have to be. As long as you give yourself enough time to disassemble the play equipment properly, your kids can continue to have fun in this outdoor feature in your new home. Michael Davies is the Senior Account Manager at Sandleford, a trusted supplier of letterboxes and home security products and solutions in Australia. The company’s Swing Slide Climb range has grown over the past 4 years, and together with Bunnings Australia, it has become one of the most exciting and innovative suppliers and developers of children’s play equipment in the Australian market.